Does UGI install the natural gas equipment or only the gas service? UGI installs only the gas service line. You will have to contact an HVAC contractor to purchase and install the equipment (natural gas furnace, water heater, dryer, range, fireplace, etc.). For a list of qualified contractors in your area, visit our Contractor Locator. How long will it take to get a natural gas service installed? In general, it takes six to eight weeks from the time you request natural gas service until the installation is complete. How much does installation cost? Is there any other amount I am responsible for paying? Your UGI Conversion Representative can provide the cost details for installation of the gas service line and any other fees. These costs will also be outlined in your Customer Agreement. Will I need to get permits prior to the work being done on my property? UGI will secure all required street rights of way and permits; your HVAC contractor will obtain permits for work done inside of your home. Will UGI dig up my yard or driveway to install the natural gas lines? If so, am I responsible for paying for any damage to my lawn or driveway? 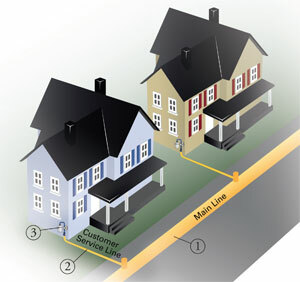 The image to the left depicts placement of a natural gas main (1), natural gas customer service line (2), and natural gas meter (3). UGI crews will need to dig a trench to install gas facilities. UGI crews make every effort to minimize the disruption on how the trenching may impact your property. Your UGI Conversion Representative can review, in detail, where the natural gas facilities will be placed, and what restoration steps will be taken. Once the new gas service line and meter are installed, how long until my sidewalk is restored? In most instances when installing a new service line, it is the customer’s responsibility to restore the sidewalk. However, in those cases where the sidewalk is disturbed and it is UGI’s responsibility to make final restoration, UGI will immediately backfill it with sand and stone to avoid any safety hazards. Then we need to wait a minimum of 90 days to allow for the settlement of the materials before restoration of the sidewalk. Paving is also seasonal and cannot be completed in the late fall/winter months. Repaving can take three months to a year. I have propane equipment that is not that old. Can I convert it to natural gas? Please contact an HVAC contractor to review your propane equipment and provide you with information about whether the equipment can be converted. Your contractor will provide information about costs associated with the conversion. To find a contractor in your area, use our Contractor Locator.